GenreOnline.net: A Great Affordable HDMI Switching Product Worth Considering As Long As You Are Aware Of The Shortcomings VS.Your Needs. A Great Affordable HDMI Switching Product Worth Considering As Long As You Are Aware Of The Shortcomings VS.Your Needs. This review is of the Kinivo 301BN Premium 3 port High speed HDMI Switch. 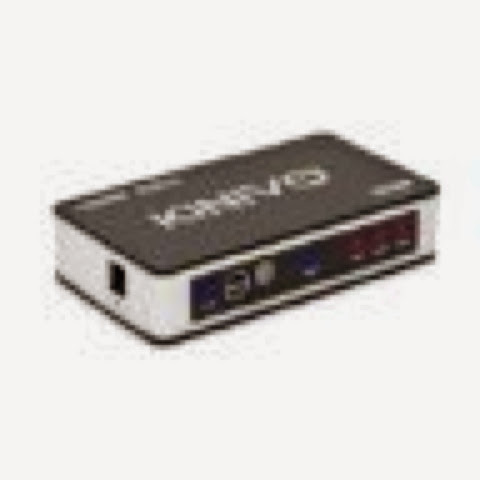 The Kinivo 301BN Premium 3 port High speed HDMI Switch is a small nifty device that allows users to connect additional HDMI components to your television when you have used up all the HDMI ports you have available on your HDTV. The device is light weight and small with a metal encasing and distinct blue LED indicator lights that lets the user know the power is on and which HDMI device is being serviced. The Kinivo 301BN Premium 3 port High speed HDMI Switch has silver and black look to it with Kinivo branding at the top and is small enough to be unnoticeable depending upon your placement within your home theater set up. The device will pass through the loss-less audio streams like DTS-HD MA as well as Dolby TrueHD. It also passes through Blu-ray 3D signals perfectly. I have had no HDCP handshake issues either. Basically my TV has four HDMI inputs, I cut the cord on cable almost six years ago and now use a combination of free over the air local broadcast television, which looks beautiful, and I supplement my TV with both a Roku 2 XS and a Third Generation Apple TV so that I can get access to all of my DRM itunes movies and TV shows from the cloud, which can only be viewed by using an Apple TV while taking advantage of the thousands of streaming channels and VOD services Roku has, but Apple does not, including my Ultraviolet cloud film and TV library, which do not run natively on Apple TV unless you airplay it from a Mac or IOS device. Combined I don't miss cable, but I also have a PlayStation 3 and a Channel Master DVR+ TV Antenna DVR as well as a normal Blu-ray 3D player and all of them require more HDMI connections than I had. With the Kinivo 301BN Premium 3 port High speed HDMI Switch I have my DVR and PlayStation 3 hooked into the box, leaving one HDMI input free for a future something and an HDMI cable goes into the TV, which has the regular Blu-ray 3D player and Roku 2 XS as well as Apple TV already connected directly to the other three HDMI inputs on my HDTV. Using the TV as a hub for my Sonos Wireless Playbar Soundbar and Sub enables me to get rid of endless speakers and chunky receivers to create a stylish and modern look. Now the Kinivo will automatically switch from an always on device to a device you may only power up when you use it so the DVR serves as my tuner and that is always on, but when I turn on the PS3, the Kinivo will switch to instantly to it. You can manually switch between devices too using controls on the HDMI switch itself or using the included credit card style remote. Please note that even though this is a three HDMI port switch, the reality is you are really getting only two additional HDMI ports since the device has to hook into one of your HDMI ports on your TV to work so be mindful of just how many devices you will be running on your TV. You may need to go with a four HDMI input or five input switch according to your needs. The power supply is attached to the plug itself so depending on placement, you might lose one outlet on your surge suppressor power strip. Otherwise this is a clean and economical solution I have no problem recommending so long as you, the consumer, know the shortcomings and have accessed your needs.